Hoodoo Fushimi - Kusaya. Vinyl LP. Bleep. Hawk-eyed label Good Find Records outdo themselves with this jagged gem. 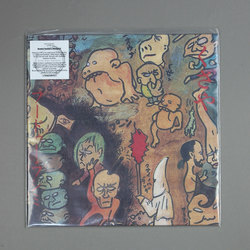 Hoodoo Fushimi’s totally bonkers 1992 LP Kusaya - appropriately named after a Japanese style fermented fish - is a salty, briny blend of far-out hip hop, glass-shattering New Jack Swing-adjacent beats, and frenetic plunderphonics. Recalling the ‘fourth world’ classicism of Ryuichi Sakamoto 80s work spiralling into a two week bender, cuts like ‘Minna Soudesho!’ and ‘Poi Poi Bushi’ are like observing the manic, late night channel-hopping of a wired insomniac. Calling Kusaya a classic would be too quotidian; this thing grabs you by the lapels and slaps your cheeks raw.